Renaissance Fair Season is upon us! I love spending a day out in the woods with the fairies and jesters, celebrating the late summertime magic. The first Fair on my list is King Richard’s in Carver Mass, and to make sure I make the most of my Fair day, I am adding a few new pieces to my costume wardrobe. The most ornate of which is this handy little bag. This small glitzy purse was inspired by the Habib Bags offered by long-time fair vendor “Moresca.” Their work is beautiful, but hardly within budget when I can make some of the pieces, or something similar myself. 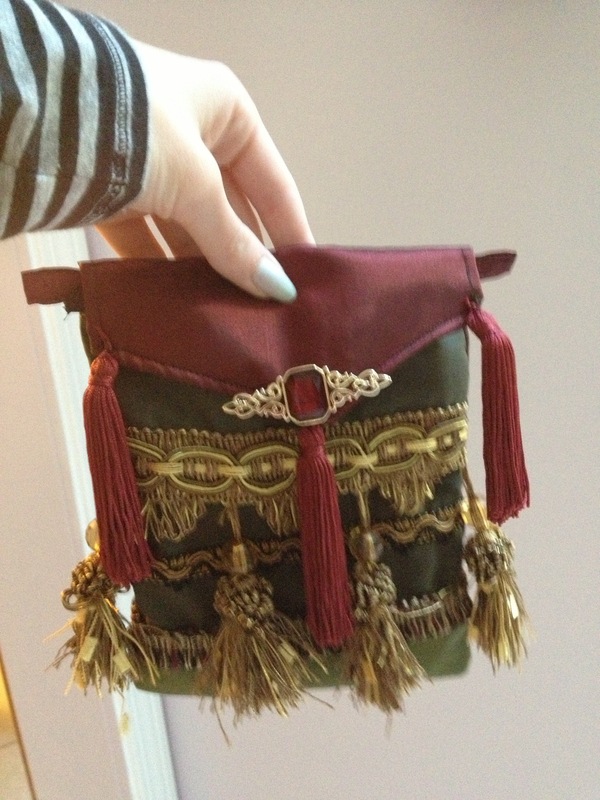 All of the fabric for this purse, the red tassels, black and gold trim, and the broach were all things that I already owned in my craft bins. The only things I had to buy new were the multi-colored loop trim and the very ornate gold curtain trim with tassels that you see running through the middle. However because I only needed a small cut of each, and could pattern the whole thing myself, this bag cost me under $10 to make! Not counting my time of course. It even has a lining. I also recently made a new belt and mini-bodice which I wore to Connecticon. 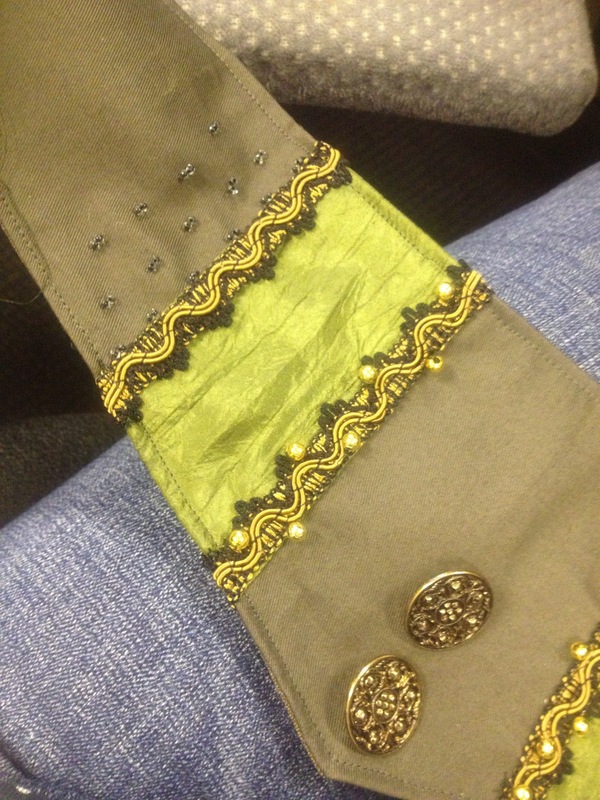 Made from green brocades and satins, with black and gold trim. Hand beaded and laced with black suede through brass grommets, this matching set is extremely versatile–especially the belt–because it is fully adjustable. I can wear it over leggings or a petticoat and two bustled skirts and it sits just fine. To spice these two pieces up for the fair I added some black and gold chains to the belt and the bodice. I’m banking on warm weather for fair day so that I can wear these chains on an open midriff. I’ll wear a shawl if I have to but the chains do not look as nice over a chemise. Anyone have any other ideas on how to winterize this bodice? I have arm socks or I could always go full cloak, but I don’t really want to cover the whole costume up. Side note–I got these chains on ebay for wicked cheap and they’re REALLY nice. I think they’re aluminum. Very pliable and easy to work with, however they are a nice thick gauge and feel quite strong when tugged on! I’m more concerned about my stitches failing than I am the chains, which is more than I expected for such cheap ebay notions. My favorite method of preparation for the fair involves spending more time outside. 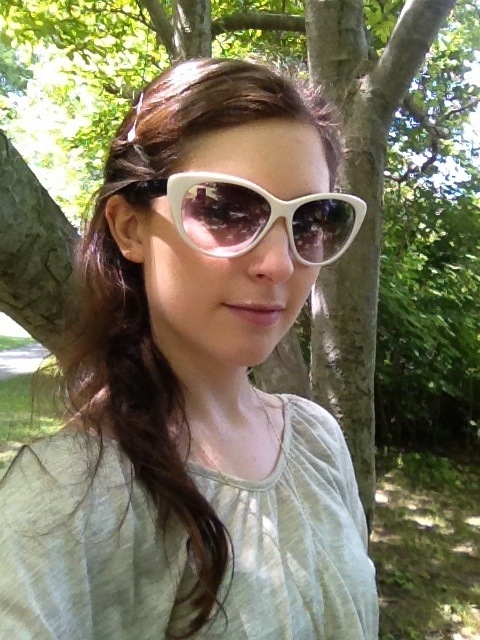 This is such a lovely time of year, and feeling a nice breeze on my skin every once and while keeps me motivated. The only other pieces of my costume that I want to update now, is to add a simple black fringe apron to sit under my fancy bag. I think it will frame it nicely and add an even more heavily layered look to my already voluminous skirts. I’ll be sure to post more pictures when the whole outfit is done! Don’t forget to subscribe to my main blog for more posts on ALL things arts, crafts, and sewing (not just the cosplay stuff).